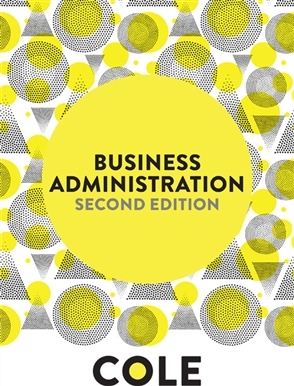 Students tackling Diploma of Business and Diploma of Business Administration must develop the skills to foster a successful, productive workplace with sound administrative systems. Kris Cole's Business Administration 2e addresses the demands of the BSB training package, and covers units common to both qualifications as well as additional electives. The book begins with units covering Personal Skills and moves into management of others. Students can follow the development of one person's team in real world decision making, contextualising their learning. Instructors receive support in teaching from a clearly structured resource including a robust teacher package: testbank, additional cases, online research activities and editable PowerPoints to facilitate lesson planning.